Windlesora is first mentioned in the Anglo-Saxon Chronicle. (The settlement had an earlier name but this is unknown.) The name originates from old English Windles-ore or winch by the riverside. By 1110, meetings of the Great Council, which had previously taken place at Windlesora, were noted as taking place at the Castle – referred to as New Windsor, probably to indicate that it was a two-ward castle/borough complex, similar to other early castle designs, such as Denbigh. By the late 12th century the settlement at Windelsora had been renamed Old Windsor. The early history of the site is unknown, although it was almost certainly settled some years before 1070 when William the Conqueror had a timber motte and bailey castle constructed. The focus of royal interest at that time was not the castle, however, but a small riverside settlement about 3 miles (4.8 km) downstream, possibly established from the 7th century. From about the 8th century, high status people started to visit the site occasionally, and possibly this included royalty. From the 11th century the site's link with king Edward the Confessor is documented, but again, information about his use of the place is scant. After the Norman conquest of England, royal use of the site increased, probably because it offered good access to woodlands and opportunities for hunting – a sport which also practised military skills. Windsor Castle is noted in the Domesday Book under the entry for Clewer, the neighbouring manor to Windsor. Although this might seem strange, it occurred because plans for the castle had changed since 1070, and more land had been acquired in Clewer on which to site a castle town. This plan was not actioned until the early 12th century. Henry I – according to one chronicle – had rebuilt it, and this followed the Norman kings' actions at other royal sites, such as Westminster, where larger and more magnificent accommodation was thought necessary for the new dynasty. King Henry married his second wife at Windsor Castle in 1121, after the White Ship disaster. The settlement at Old Windsor largely transferred to New Windsor during the 12th century, although substantial planning and setting out of the new town (including the parish church, marketplace, bridge, hermitage and leper hospital) did not take place until c. 1170, under Henry II, following the civil war of Stephen's reign. At about the same time, the present upper ward of the castle was rebuilt in stone. Windsor Bridge is the earliest bridge on the Thames between Staines and Reading, built at a time when bridge building was rare; it was first documented in 1191, but had probably been built, according to the Pipe rolls, in 1173. It played an important part in the national road system, linking London with Reading and Winchester, but also, by diverting traffic into the new town, it underpinned the success of its fledgling economy. The development of the castle continued in the late 15th century with the rebuilding of St George's Chapel. 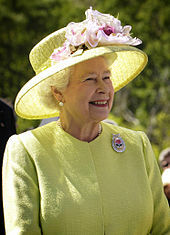 With this Windsor became a major pilgrimage destination, particularly for Londoners. Pilgrims came to touch the royal shrine of the murdered Henry VI, the fragment of the True Cross and other important relics. Visits to the chapel were probably combined with a visit to the important nearby Marian shrine and college at Eton, founded by Henry VI in 1440, and dedicated to the Assumption; which is now better known as Eton College. Pilgrims came with substantial sums to spend. From perhaps two or three named inns in the late 15th century, some 30 can be identified a century later. The town again grew in wealth. For London pilgrims, Windsor was probably – but briefly – of greater importance than Canterbury and the shrine of the City's patron Saint Thomas Becket. With the closures of the Reformation, however, Windsor's pilgrim traffic died out, and the town began to stagnate about ten years afterwards. The castle was considered old-fashioned and shrines to the dead were thought to be superstitious. The early modern period formed a stark contrast to the medieval history of the town. Henry VIII was buried in St George's Chapel in 1547, next to Jane Seymour, the mother of his only legitimate son, Edward (Edward VI). Henry, the founder of the Church of England, may have wanted to benefit from the stream of pilgrims coming to the town. His will gives that impression. Most accounts of Windsor in the 16th and 17th centuries talk of its poverty, badly made streets and poor housing. Shakespeare's play The Merry Wives of Windsor is set in Windsor and contains many references to parts of the town and the surrounding countryside. Shakespeare must have walked the town's streets, near the castle and river, much as people still do. The play may have been written in the Garter Inn, opposite the Castle, but this was destroyed by fire in the late 17th century. The long-standing – and famous – courtesan of king Charles II, Nell Gwyn, was given a house on St Albans Street: Burford House (now part of the Royal Mews). Her residence in this house, as far as it is possible to tell, was brief. Only one of her letters addressed from Burford House survives: it was probably intended as a legacy for her illegitimate son, the Earl of Burford, later the Duke of St Albans. In 1652 the largest house in Windsor Great Park was built on land which Oliver Cromwell had appropriated from the Crown. Now known as Cumberland Lodge after the Duke of Cumberland's residence there in the mid-18th century, the house was variously known as Byfield House, New Lodge, Ranger's Lodge, Windsor Lodge and Great Lodge. Most of the current town's streets date from the mid to late 19th century. However the main street, Peascod Street ( /ˈpɛskɒd/) is very ancient, predating the castle by many years, and probably of Saxon origin. It formed part of the 10th-century parish structure in east Berkshire and is first referred to as Peascroftstret in c. 1170. The 1,000-year-old royal castle, although the largest and longest-occupied in Europe, is a recent development in comparison. "New Windsor" was officially renamed "Windsor" in 1974. The original parish church of Windsor is dedicated to Saint John the Baptist and is situated adjacent to the High Street. The church is said to have dated from the time that King Henry I moved the Royal Court from Old Windsor to ‘New Windsor’. The church was clearly established by the time of Henry II in about 1110, as there are references to it by then. In 1543, Henry Filmer, Robert Testwood and Anthony Pearson, the three Windsor Martyrs, were burnt at the stake in Deanery Gardens, near the church. The original church building had Saxon arches and Norman work and by the 18th century it was described as ‘a vast building with 10 side altars and several chantries’ and perhaps eight gabled roofs. There was a small spire on top of the main central tower. In 1818 the high cost of repairs to the old building led to plans for a complete rebuild at a cost of £14,000. Charles Hollis was appointed architect and the new building was erected between 1820 and 1822 with cast iron columns that were floated down the Thames. The ribs that support the roof are also cast iron. The new church, Gothic in style with a pinnacle tower containing the bells, was officially consecrated by the Bishop of Salisbury on 22 June 1822. Samuel Sanders Teulon added the chancel and the apse in 1880. The chancel screen was added in 1898 to mark the 60-year reign of Queen Victoria. In 1906 the Hunter Organ was installed. The north side gallery was reduced in length to make way for the organ. 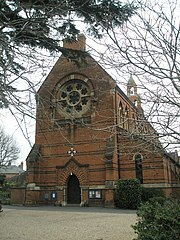 The more recent parish church of All Saints' is situated on Frances Road. The incumbent vicar is the Revd Ainsley Swift. The author Thomas Hardy trained as an architect and joined Arthur Blomfield's practice as assistant architect in April 1862. Between 1862 and 1864 he worked with Blomfield on All Saints'. A reredos, possibly designed by Hardy, was discovered behind panelling at All Saints' in August 2016. As a tourist town there are many gift shops around the castle, together with shops and restaurants in Windsor Royal Shopping inside Windsor & Eton Central railway station. The main shopping street, Peascod Street, includes an independent department store, W J Daniel & Co., noted for its large toy department, as well as national chains such as Marks & Spencer, Boots and TK Maxx. King Edward Court, a pedestrian-only shopping centre, has a Waitrose supermarket alongside other stores including H&M, Mr Simms Olde Sweet Shoppe, New Look and Zara. Windsor is accessible from Junction 6 of the M4 and from Slough via a 3 mile long dual carriageway. Bus services in the town are provided by Reading Buses, Courtney Buses, and First Berkshire & The Thames Valley. Windsor has two railway stations. Windsor & Eton Central railway station has a shuttle service to Slough connecting with express trains to London Paddington and to Reading. Windsor & Eton Riverside station provides a service to London Waterloo. Both stations were built at around the same time in the 19th century, as the two train companies which owned the lines both wanted to carry Queen Victoria to Windsor, with the first line opened gaining the privilege. From 1883 to 1885, the London Underground's District line's westbound service ran as far as Windsor. Comedian Billy Connolly lived in Windsor for several years in the 1990s. New Zealand motorcycle racer Bruce Anstey has a home in Windsor and spends some of his time there with his partner, Anny. Chelsea and England footballer Peter Osgood was born and resided for many years in Windsor. Windsor's senior football team is Windsor F.C. The team currently play in the Hellenic League and their home ground is Stag Meadow, granted to the original club by King George V in 1911. The club's president is the famous BBC commentator Barry Davies. Neighbours, Windsor Rugby Club also use the ground and the team currently plays in the Southern Counties – North Division. Royal Windsor Rollergirls were one of the first roller derby leagues to be founded in the UK in 2007, they regularly hold games at Windsor Leisure Centre. Windsor is part of the Royal Borough of Windsor and Maidenhead which is administered by an elected unitary authority. The mayor is Cllr Paul Lion (Conservative). In 2018 the belongings of homeless people were controversially removed and stored for reasons of security.. A bus intended to shelter the Windsor homeless during the period of the wedding was impounded by police. ^ "The Online Etymology Dictionary". Etymonline.com. Retrieved 3 February 2012. ^ "A Brief History of Windsor". Thamesweb.co.uk. Retrieved 3 February 2012. ^ "The Parish Church of St. John The Baptist, Windsor. A History". Thamesweb.co.uk. Retrieved 3 February 2012. ^ Stoughton, John (1862). Windsor: A History and Description of the Castle and the Town. Ward. pp. 176–. 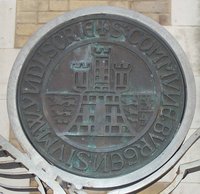 ^ a b c d e "St John the Baptist Windsor - History". Official website. Retrieved 23 July 2017. ^ "New Windsor: All Saints, Windsor". A Church Near You. ^ Jedrzejewski, J. (18 December 1995). "Thomas Hardy and the Church". Springer – via Google Books. ^ "CONFIRMED: Two bus companies step up to save axed services in Slough and Windsor". Royal Borough Observer. Retrieved 2019-01-21. ^ "The Railways at Windsor - The Royal Windsor Web Site History Zone". www.thamesweb.co.uk. Retrieved 2015-05-31. ^ "National Public Transport Information - from traveline SE & anglia". www.travelinesoutheast.org.uk. ^ "Windsor Hurricane". Sir Sydney Camm Commemorative Society. ^ "Homeless people in Windsor have belongings removed to be stored ahead of the Royal Wedding". iNews. 2018-05-16. Retrieved 2018-05-18. ^ "Homeless refuge bus seized by police in Windsor ahead of Royal wedding". Evening Standard. Retrieved 2018-05-18.